Coastal American cities are sinking into saturated new realities, new analysis has confirmed. Sea level rise has given a boost to high tides, which are regularly overtopping streets, floorboards and other low-lying areas that had long existed in relatively dehydrated harmony with nearby waterfronts. The trend is projected to worsen sharply in the coming years. 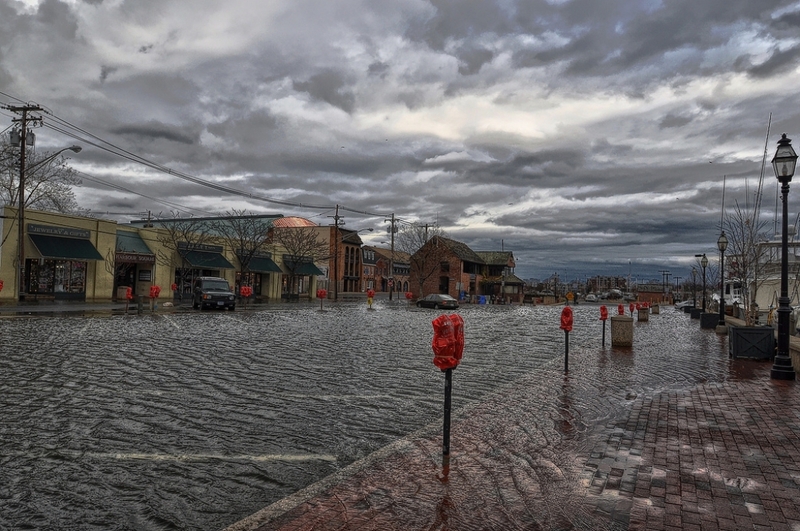 A new report, released by the Union of Concerned Scientists late on Tuesday, forecasts that by 2030, at least 180 floods will strike during high tides every year in Annapolis, Md. In some cases, such flooding will occur twice in a single day, since tides come in and out about two times daily. By 2045, that’s also expected be the case in Washington, D.C., Atlantic City, N.J. and 14 other East Coast and Gulf Coast locations out of 52 analyzed by the Union of Concerned Scientists. 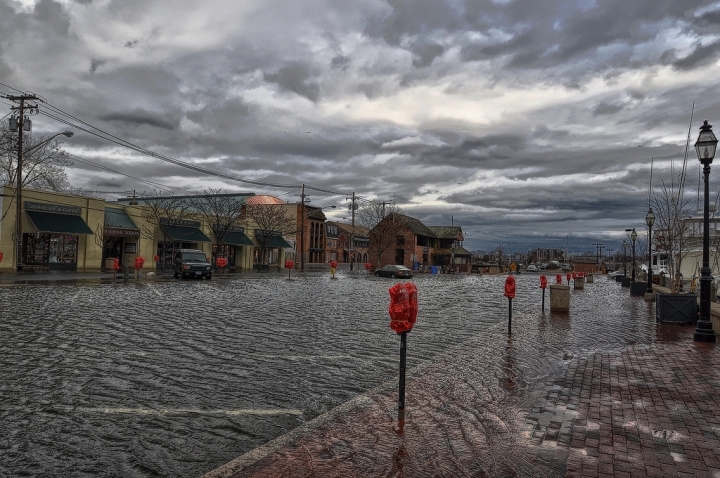 Tidal flooding in Annapolis in 2012. The group originally set out to study increased risks of storm surges and hurricanes as seas rose, but quickly changed tack. The following interactive could help you assess the future flooding risks in your city. An interactive analysis from Climate Central showing what states and cities are most vulnerable to future sea level rise under different greenhouse gas emission scenarios. The researchers used intermediate-to-high sea level rise projections from the recent National Climate Assessment to guide their predictions for future coastal flooding rates. Those projections included a rise in sea levels of five inches between 2012 and 2030, and a rise of nearly a foot between 2012 and 2045. To help consider the effects of local conditions, such as the sinking lands of the mid-Atlantic coast, the group used data compiled by Climate Central’s team of scientists. The 52 locations, from Portland, ME, to Freeport, Texas, were selected because the National Weather Service issues flood advisories based on local tide gauge recordings there. That allowed the researchers to confidently use the tide gauge data to calculate historical flooding rates, and compare those with projected future rates. In the absence of flood-deflecting marshes, seawalls or levees, two-thirds of the 52 communities studied can expect a tripling in the frequency of high-tide flooding during the next 15 years, the researchers concluded. Half of the communities studied are expected to be flooded more than two dozen times every year by 2030. The research was published as the double decker effects of rising seas and king tides spectacularly flood Floridian shorelines. Without the 8 inches of sea level rise recorded since pre-industrial times — one of the hallmarks of climate change — those king tides would not have the same flooding effects. The projections were published four months after the National Oceanic and Atmospheric Administration (NOAA) released an analysis of the recent rise of tidal floods, which it calls nuisance floods. That analysis revealed that nuisance floods were occurring now in some places nearly ten times more often than had been the case in the 1960s. Sweet advised the Union of Concerned Scientists team on how to use NOAA’s tide gauge data. He is working with NOAA colleagues to publish their own projections for the future rise in nuisance flood rates. He said the agency’s findings, which he expects to be published in a peer-reviewed journal by the end of this year, would be “similar” to the those published this week by the Union of Concerned Scientists. Sweet said NOAA is producing the forecasts to provide communities with “environmental intelligence” to help them plan for the fast-growing hazards associated with sea level rise. The new report provides examples of some of ways in which hard-hit communities are already adapting to rising seas, such as work to raise roads in New York City’s Jamaica Bay. In Annapolis, along the vulnerable Chesapeake Bay coastline, a partnership between the Navy and local authorities has produced what Fitzpatrick called “the most forward thinking” approach to adapting to rising seas, partly because the floods are being viewed as a national security threat.